Desfrute belo Boulder da melhor localização possível, à direita centro, no topo de uma histórica casa vitoriana de 1880, recentemente renovado. Este terceiro andar da cobertura cheia de luz oferece as melhores vistas, belas acomodações e o máximo em conveniência para o turista, visitando profissional ou artista procurando um retiro tranquilo. Esta praça penthouse 1.000 pé possui duas entradas privadas, uma sala de comer na cozinha, e built-in recanto de escritório, uma alcova com uma cama king-size e um quarto privado com um armário, built-in gavetas e armazenamento adicional , uma cama full-size e um banheiro completo. Não há armazenamento suficiente em todo o apartamento. Desfrute de um copo de vinho enquanto observa o pôr do sol atrás das montanhas a partir de um, 250 deck privativo square-foot. Criar adorável refeições em uma cozinha gourmet generosamente nomeado ou passear com qualquer das dezenas de restaurantes finos. Rosas da herança enfeitam os motivos que tornam esta propriedade uma lenda entre rosarians locais. Nosso centro de localização central, juntamente com o transporte público nas proximidades de Denver ea Eldora Ski Resort, tornam este o ideal de férias sem carro. O campus da Universidade de Colorado fica a apenas 15 minutos a pé. Alugue uma bicicleta de montanha e todas as Boulder está ao seu alcance. O espaço acomoda quatro, eu posso considerar mais pessoas se é uma família nuclear viajando juntos. Por favor, verifique com antecedência. O espaço está localizado acima da sala de estar da minha família, então seja informado de que o tempo de silêncio de 10:00 a 8:00 será executado. É perfeito para escapadelas suaves, mas não para noites atrasadas e festas. Este espaço não é impermeabilizado e não é adequado para crianças pequenas. A maconha é legal no Colorado e congratulamo-nos com os turistas de todos os tipos. Por favor, tenha em mente que temos crianças pequenas e não quer que eles expostos a estava embriagada ou comportamento alterado. Chamas, cigarros, cachimbos, narguilés e vaporizadores não estão autorizados a ser usado na propriedade (dentro ou fora) por causa do risco de incêndio e odor. Ele irá resultar na perda de todo o seu depósito de danos. Por favor, note que eu tenho uma política de estadia mínima de 5 dias para reservas feitas com mais de um mês de antecedência, a menos que o calendário atual apenas permita estadias mais curtas. Os cancelamentos feitos mais de trinta (30) dias antes da data de chegada não terão penalidade. Os cancelamentos ou alterações que resultam em uma estadia encurtado e que são feitas no prazo de 30 dias a contar da data de chegada, perder o pagamento antecipado integral. Cancelamento ou saída antecipada não garante qualquer reembolso de aluguel. Nós recomendamos que você compre de viagem seguro de cancelamento no caso em que a viagem tem de ser cancelado razões, tais como doença, acidente, morte de um membro da família ou companheiro de viagem, o serviço do júri, as condições meteorológicas que causam atraso / cancelamento da viagem ou incêndio ou inundação em sua casa, esta cobertura protege o seu investimento e reembolsará os pagamentos normalmente não reembolsáveis ​​que você faz para o seu aluguer de férias. InsureMyTrip fornece vários níveis de protecção férias e viagem. Esta propriedade é licenciada com o número da propriedade da cidade de Boulder RHL-0001896. Estadas são avaliadas os impostos apropriados que são remitidos para a cidade trimestralmente. São proibidas estadias superiores a 29 dias. Casa de banho completa com chuveiro e banheira. Sweet cozy nook in downtown boulder with amazing views! We had a wonderful white winter holiday with amazing views of the Flatirons and comfy beds in the penthouse apt. The kitchen had everything we needed and there was even a turntable with classic albums! Beautiful place with fabulous view of Flatirons! We spent 3 nights at this beautiful penthouse apartment while moving our daughter in for her sophomore year at CU. we loved sitting out on the deck watching the stars at night and soaking in the view of the Flatirons in the morning. We will definitely stay here again when we come back to visit our daughter! The Boulder spirit is there! So cute, they even have a rooster and a hen! The apartment is very cute and cozy. Well equipped kitchen. I loved the chickens and the owner's dog, Blue. Will definitely try to stay there for our next trip to Boulder. The Fryehouse is a lovely spot to take in Boulder's sights. 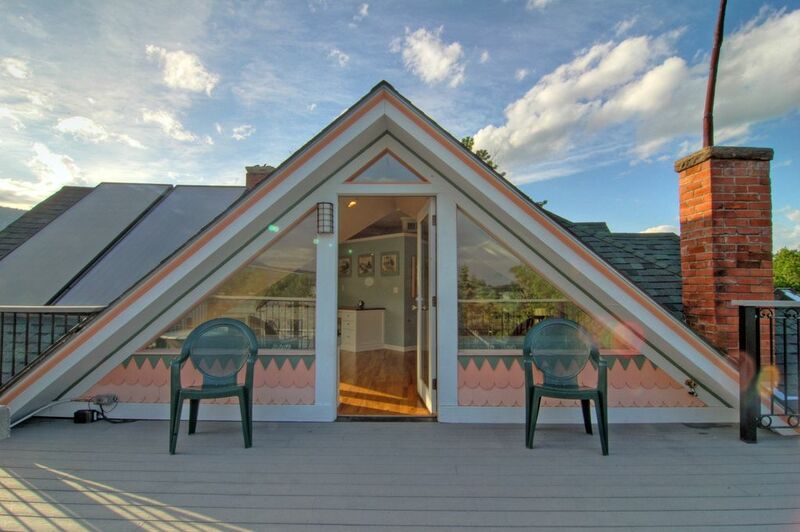 The deck is gorgeous and overlooks the Flatirons, the space is clean and modern, and the kitchen is well appointed. Vivian and Lonny are great hosts, they are available at the drop of the hat but respect your privacy and personal space. I love their dog Blue, he's a big sweetheart and the chickens are so much fun to watch. This spot is a gem, so close to Pearl Street that you don't need to rent a car, and in a historic neighborhood. I'm looking forward to coming back. It was not easy for me to get to this point as I’ve never written a negative review, but after much consideration I felt other families need to know. Upon arriving late in the evening, we began putting our kitchen items away and noticed in their kitchen cabinet drawer that stored the coffee that it was in a huge mess (a mouse).The owner was immediately emailed of the situation. She promptly replied that she would address it tomorrow and reported that she just “didn’t check that drawer prior to our arrival”. The next morning, the owner came up very early unannounced not to clean the drawer, but to tell us that our kids were walking too loudly and to keep it down until 8 AM; we reminded her to check the drawer. She reported that she would clean it that day. We left for the day to come back disappointed to the same mess. My husband opened up the drawer to be startled by a mouse that jumped out of the drawer & then scurried under the dishwasher. We immediately went downstairs to the owners’ floor and told them the mouse needed to be addressed now. They lightly cleaned the area and set traps. We found half a mouse the next morning in the drawer with his guts & fur everywhere (likely from a cannibal mouse). More traps had to be set and unfortunately it was when I was alone in the unit in the bathroom; the male owner had knocked and just came on in and had a conversation with me while I was in the bathroom! After the first mouse was caught, we asked for the unit to be cleaned, specifically the mouse droppings. They immediately did that, but sadly we still found droppings in the kitchen. Gross. This next story is what pushed me to write the review. Prior to booking the unit, I e-mailed the owner if her unit would be sufficient for a family of four including a 5 & 2 year old; she immediately responded, ‘yes.’ She is correct. The unit has plenty of space and beds. The one thing she failed to mention is their big blue Great Dane doesn’t like children. This unit is located on the 3rd floor. You have to walk past the owners’ floor & front yard to get to the stairs that lead you up. It was soon into our stay, when we encountered a huge Great Dane outside and not behind the gate. He came towards my family and we were going to greet him, but the owner ran outside quickly and said, “NO. He’s not good with kids!! He’s good with my kids, but I can’t trust him around other kids!! !” We immediately detoured with my 5 year old asking what he thought the dog would do to him. All I can do is apologize for the mouse situation. It was unprecedented and unfortunate. I refunded a night's stay for the inconvenience of having us enter their space. It's always a balancing act trying to figure out the right time to come in, not wanting to intrude. My husband was embarrassed to interrupt you in the bathroom, he had no way of knowing. As for my dane, he is kept in a fenced yard when he is outside, which isn't often. The yard does not have to be walked through to access to the apartment, it can be walked around. I always err on the side of caution when it comes to my dog and children. He has never had an incident with a child but I always caution people strongly about him because people tend to dismiss light warnings. I have seen incidents among children and dogs and never want that to happen to us.. He's a rescue dog and timid and I won't take any chances with him or anyone else. Again, I am so sorry for the mouse situation. I've never seen anything like it before. A duas quadras do Pearl Street Mall, a curta distância dos melhores restaurantes de Boulder, vida noturna e compras, ciclovias Boulder próximas e Creek Path, birding, flyfishing, cafés, transportes públicos em torno de Boulder e para Denver, Boulder International Film Festival, Conferência sobre Assuntos Mundiais , perto de NIST, NOAA, NCAR, Universidade, Oficina de Yoga de Richard Freeman eo Boulder Iyengar Center estão a uma curta distância. I have a 5 day minimum stay policy for bookings made more than a month in advance unless the calendar only allows for a shorter booking.